Website for an up and coming cartoon series. Creator Melissa Leonard brought us together with the amazing Warner McGee at the helm for character development and Michael Maurer as writer. Worlds and cultures collide in this dynamic new 11-minute preschool series starring Dash, an adventure-seeking mutt from the big city, who discovers Kookatoo, a fabulous jungle village nestled amongst cascading waterfalls and giant Jackleberry trees where animals walk and talk and act civilized just like humans do. Unleashed for the first time in his life, our Peter Pan-ish pup relishes both his freedom and his amazing new friends — tempting them to explore the outer limits of adventure — one paw at a time! 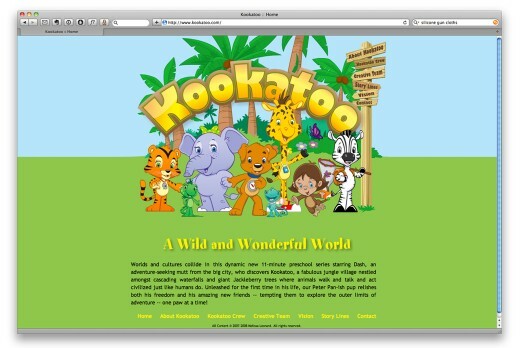 "John was amazing at bringing our Kookatoo website to life! His ability to balance what the client wants and what a website needs is truly incredible. John’s professionalism, sense of humor and marvelous creativity makes him stand above and apart from others in his field."